JenniferTintner/TwitterAn image believed to be Nikolas Cruz being taken into custody, according to WPTV-5’s sources. 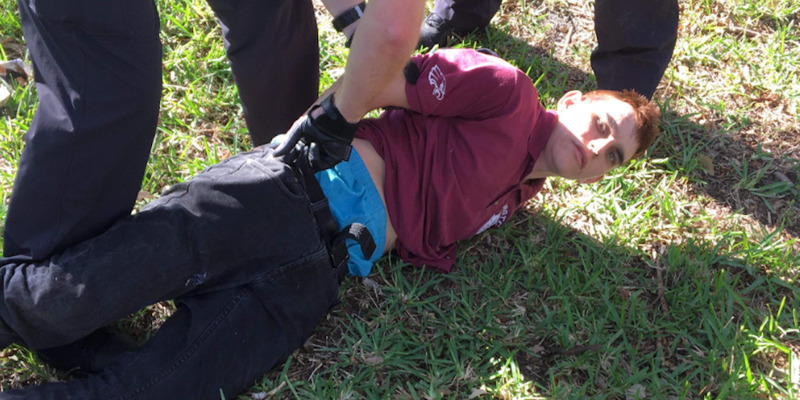 Law enforcement has named Nikolas Cruz, 19, as the suspect in Wednesday’s shooting at Marjory Stoneman Douglas High School in Parkland, Florida. Cruz used to attend the school. The shooting left at least 17 people dead and 14 injured, according to law-enforcement officials. A student who attended an alternative school with Cruz said Cruz had shown off pictures of guns on his phone. Law-enforcement officials have begun releasing details about the suspect in Wednesday’s high-school shooting that claimed the lives of at least 17 people and injured 14. Nikolas Cruz, a 19-year-old who had been expelled from Marjory Stoneman Douglas High School, where the shooting took place, was taken into custody by the police, the Broward County Sheriff’s Office confirmed. Jim Gard, a teacher at the school who taught Cruz, said that he was told Cruz “wasn’t allowed on campus with a backpack on him” and that Cruz had threatened fellow students, the Miami Herald reported. Robert Runcie, the Broward Schools superintendent, said that while there “potentially could have been signs” the shooting would happen, officials “received no warnings,” the Herald reported. A student who attended the same alternative high school as Cruz after Cruz’s expulsion said Cruz was known to have flaunted pictures of firearms on his phone. “I didn’t want to cause any conflict with him because that’s the impression he gave off,” the student added. The student also said he knew as of two years ago that Cruz had guns at his home. The school enrolled 3,208 students grades nine to 12, according to the Sun-Sentinel.